Carpe Vita liveaboard - Maldives diving luxury - Book now ! Carpe Vita, the new upgraded sistership of the Carpe Diem and the middle addition to the Explorer Ventures Fleet. Carpe Vita will be accompanied by a specially designed new 61 foot diving dhoni (diving tender) to meet the needs and comfort of the divers today. Carpe Vita will be a more luxurious version of the Carpe Diem, mainly focussing on the dive industry by offering itineraries with 3 dives a day and Free Nitrox to qualified divers. Carpe Vita with her 38 meters in length is bigger than the Carpe Diem, but still catering for a maximum of 20 people. With 10 cabins divided over 3 decks providing a lot more space. 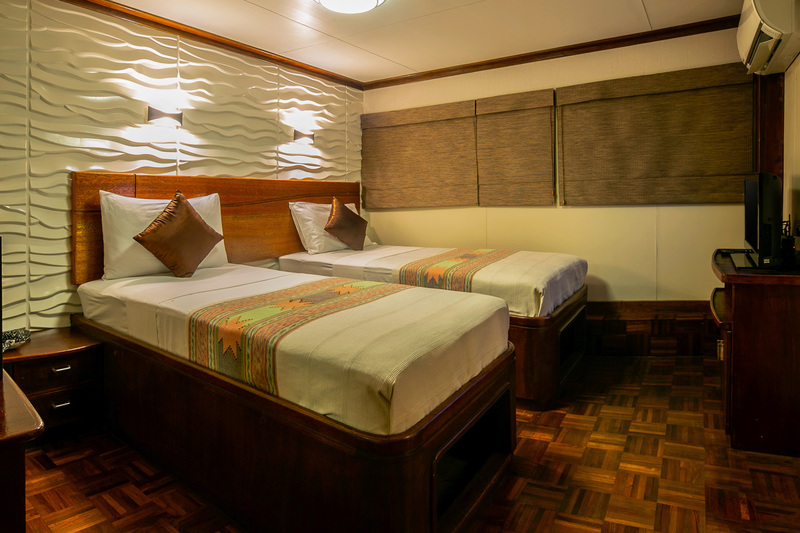 The 10 comfortable cabins of different standards are divided over 3 decks. The different cabin types are VIP suite (2), Superior (2) and standard (6). 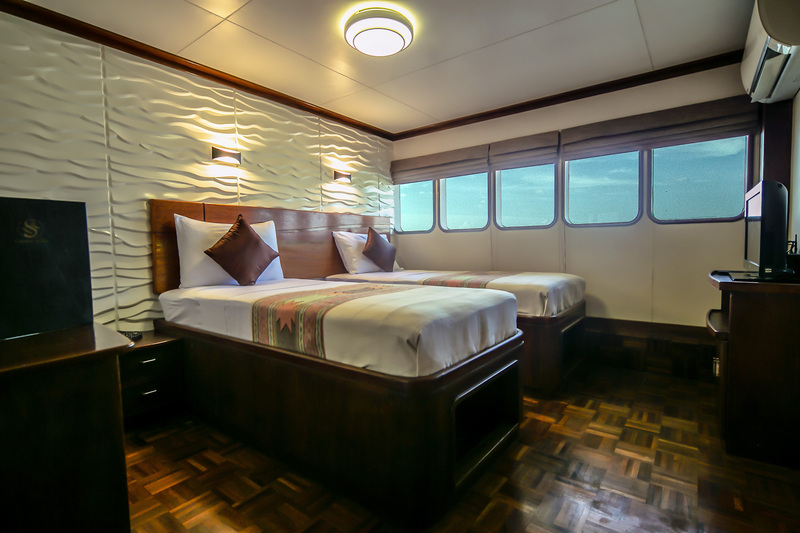 All cabins have individually controlled AC, safety deposit boxes and their own private bathroom with toilet and hot water shower. Carpe Vita like the Carpe Diem caters for dedicated scuba diving, wave surfing ,fishing and tailor made trips for both individuals as well as groups and offers free Nitrox to qualified divers. Carpe Vita's itineraries are designed to take advantage of the changing conditions and to take divers to the best diving areas for the different seasons. The visibility is usually at its peak in December/January. Mantas can be seen throughout the year with the best feeding-station encounters typically during the May-November time frame. Whale sharks are also seen most every month of the year, with the highest concentration seen in the monsoon transition months of April-May and October-November. The water temperatures remain a toasty 28C (80-85º) throughout the year. Most divers are comfortable with a 3mm wetsuit. Also Carpe Vita will be doing special routings to the South and back to be able to get away from the crowd and offer clients, particularly repeat clients something different from the standard Ari Atoll routing. These routings will take place during peak high season (February/March) when the currents are at its strongest and visibility at its best to see the abundance of shark life the Maldives has to offer. Because these routings involve a lot of traveling, the fuel surcharge will be higher than on the normal routings, only 3 dives a day will be offered instead of the usual 4 on the Vita and there will be a need for a domestic flight, either to join the boat or to return after finishing the trip. Prices are per week long trip per person in Us$ based on double or twin sharing occupancy. Accommodation in air conditioned cabins, ensuite shower (with hot water) toilet, toiletries, towels and beach towels. 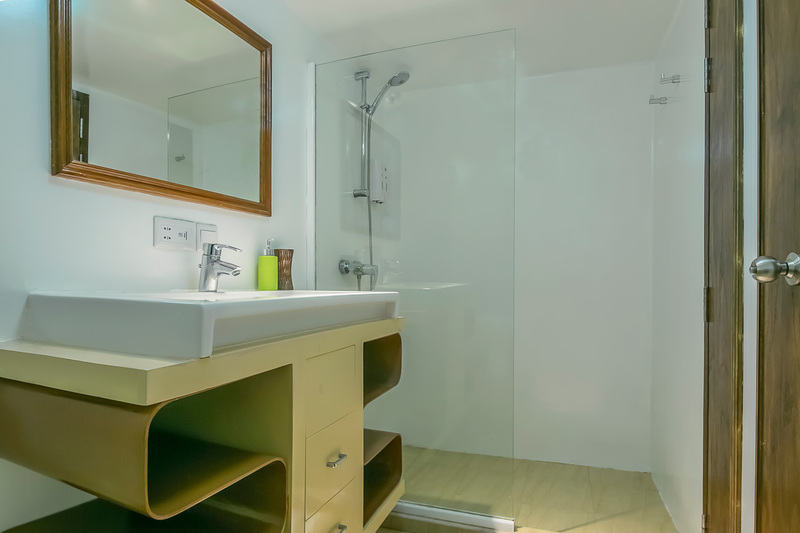 Accommodation in air conditioned cabins with ensuite shower (with hot water) toilet, toiletries, towels and beach towels. Air-conditioning in all enclosed areas. Full board meals, breakfast, Lunch, and Dinner. 3 guided dives per day (depending on your arrival time in Male, weather conditions and 24-hours no diving before fly safety rule) including one night dive. The day before departure a maximum of 2 dives will be offered. GST (12%) – Rates will be adjusted in case GST were to change. Scuba Equipment rental (with the exception of Discover Scuba Diving Experience and Open Water Course, in which equipment rental is included in the fee, but limited to its duration). Extra Dives are charged at 25 US$ each, not including equipment rental. For trips to Baa and Raa atoll $100 per person fuel surcharge. If you book 5 full paying guests you will receive the 6th free of charge! Carpe Diem Maldives Pvt. Ltd. does not offer refunds in the event of personal injury, airplane delay, mechanical breakdowns, weather, sickness, strikes, war, criminal acts, quarantine, acts of god, if another guest requires immediate evacuation and the vessel must return to port or any other event beyond its actual control. Guests are strongly advised to have valid dive medical, travel and cancellation insurances. 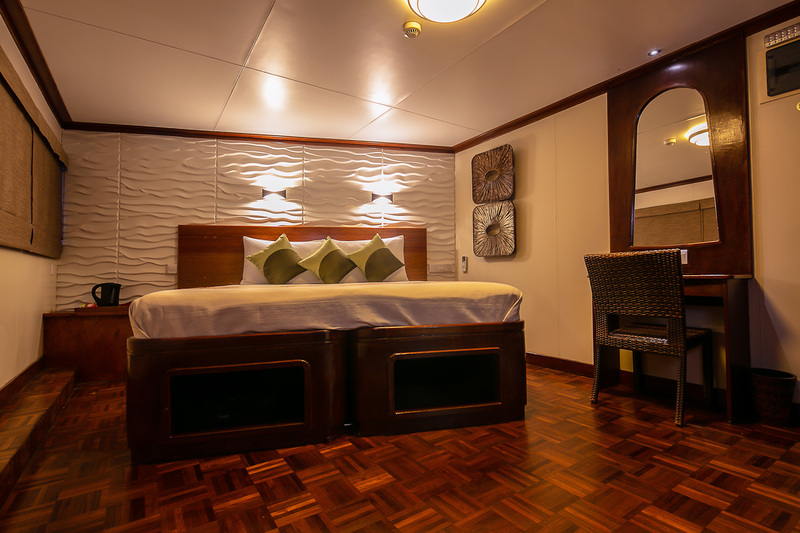 Carpe Vita has 10 comfortable cabins of different standards divided over 3 decks. 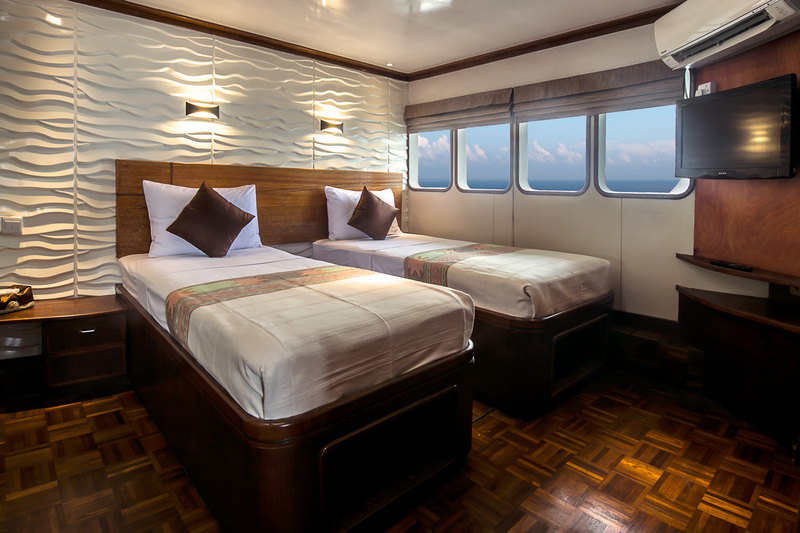 The different cabin types are suite (2), superior (2) and standard (6). 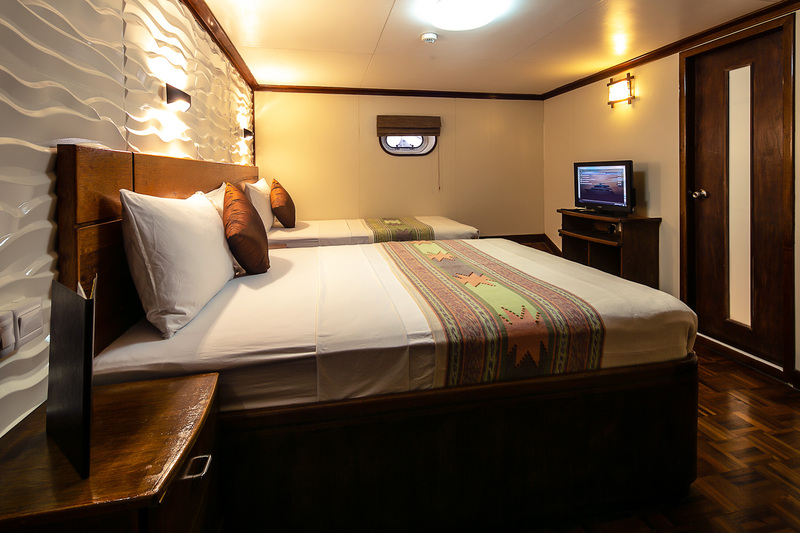 All cabins have individually controlled AC, safety deposit boxes and TV screens with DVD players and their own private bathrooms. The electricity voltage on board is of 220V and the plugs are of 3 pins US type. All the cabins have a name of a sea life creature instead of a number. The very spacious suite cabins, Nos. 1 and 2. The cabins have king size (California) beds which can be separated in two super single beds (39 inches), a wide flat screen TV plus DVD/HD player, desk/chair/dresser, two hanging closets, windows throughout the side of the cabin, bathroom with dual sink, bath tub and separate shower cubicle. The Carpe Vita has two superior cabins, nos. 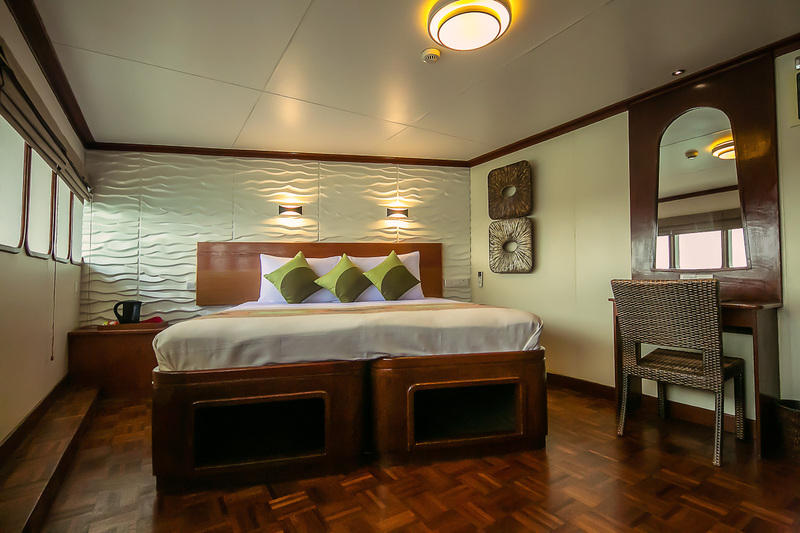 3 and 4 located on the main deck with king size beds which can be separated in two super single beds and desk/chair/dresser, hanging closet, large windows, private ensuite bathroom and shower cubicle. A total of 6 standard cabins, nos. 5 - 10 are located on the cabin deck below the main deck. 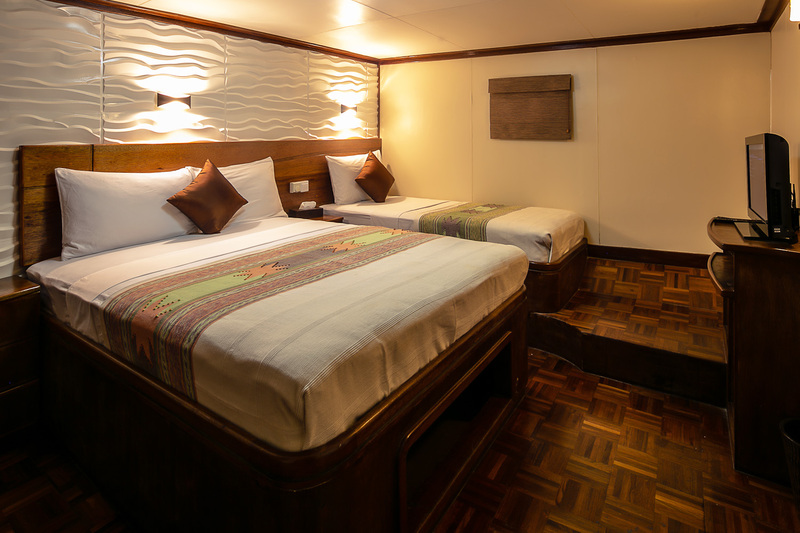 All cabins have one queen size bed and and super single bed, desk/chair, dresser, private ensuite bathrooms with showers. All standard cabins have portholes. There is a fixed boarding time and it is not possible to take guests earlier to the boat nor take luggage earlier to the boat, the boarding time for Carpe Vita is 2.30 pm. For your flight arrival times ideally you should aim to arrive around 12-1pm or before on the day of departure as due to a same day turn around of the boat the guests from the trip before will be departing in the morning. The rest of the morning the boat will be being cleaned and prepared for your arrival. You will be met off your flight at the arrivals area by the boat representatives and taken to the boat, about 10 minutes from the airport. Any transfers outside of these times will be charged. In case of early arrival guests will be met by the representatives at the airport and will have the option to wait at the airport or arrangements could be made to use the facilities of the nearby airport hotel for a small extra charge until check-in time for the boat. Check out time will be latest by 8 am on the day of departure but an early departure is available if needed. This is included in the price. Any transfer outside the above will be charged at 10 USD p/p and if the dhoni has to go out at night for additional pick up or departure for 2 persons or less it will be 25 USD p/p. For more than 2 people or more it will again be 10 USD p/p. Later arrivals are possible. Clients will be picked up separately but will not be able to participate in the check dive. If you would like to arrive the day before it is possible to stay in the airport hotel or stay in another guesthouse on Hulhulemale Island for the night, we don’t recommend booking somewhere in Male as this involves a ferry ride to the next island. If you stay on Hulhulemale island your hotel will then deliver you back to the airport the following day (the day of departure) where you will be met by the boats representatives and taken directly to the ship. Please check with your hotel / guest house if this is a free transfer as some of them charge for this service. Planes do not fly late into the night so you will be able to sleep. Carpe boats do not require a min. amount of dives as that does not always tell enough. They do require min. of AOWD certification to be able to join for all the dives offered during a trip. Nitrox certification with the multiple dives per day we offer is highly recommended as well, but can be done on board as well in case you do not have it yet. OW Divers are welcome, but will be asked to do their AOWD during the trip as otherwise the person will be limited to 18 M depth and hence just a few dives. The dive instructor on board is responsible for everyone’s safety and can ask people to sit a certain dive out if he thinks they are not experienced enough for it. On the special South routings with lots of current, they do require a minimum of 100 dives experience and experience with currents. Days aboard Carpe Vita Explorer generally involve a cold breakfast from 6:00am followed by a first morning dive, Full breakfast, second morning dive, lunch around 12:00 pm, two afternoon dives and dinner at 6:30 or 7:00 pm. On the dayor days when night dives are offered, dinner is typically around 8:00 pm. 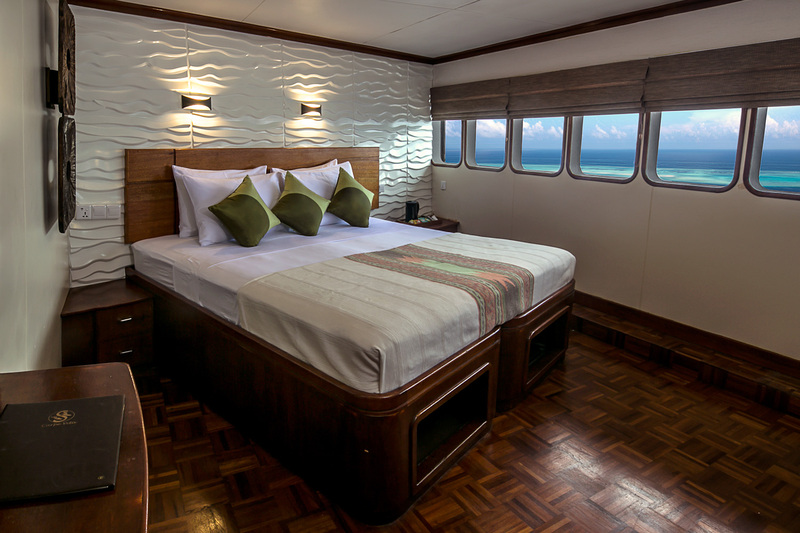 Carpe Liveaboards runs 7, 10 and 14 night cruises. There are 3 guided dives per day (depending on your arrival time in Male, weather conditions and 24-hours no diving before fly safety rule, 1 check dive on day of arrival around 4 pm after finishing paperwork (if you arrive later you loose this dive, followed by 5 days of 3 dives a day and a maximum of 2 dives on the day before departure - normal total 17/18) including one night dive. This cruise will take you to the most popular dive sites in South Male Atoll and Ari Atoll, weather conditions permitting of course. This route is renowned for spotting big pelagics like Mantas, Sharks and Whale sharks. Famous dive sites included in our itinerary are Kudarah Thila, Manta Point, Maaya Thila and Fish head which are well known for this. This cruise will take you to the beautiful dives sites of North and South Male Atoll, North and South Ari Atoll apart from Rasdhoo and Felidhu Atoll. Not only are you likely to see Mantas, Sharks and Whale sharks but there is a good possibility for spotting Hammerhead sharks as well. Although the above mentioned itineraries are our so called classical dive routes followed by most of the safari boats in the Maldives, the cruise director is flexible and will adjust the route depending on the main activity and interest of the group like in case of fishing groups or surf groups. Apart from that the Carpe Liveaboards can take special requests for different itineraries like North Male, Baa and Raa Atoll or South Male and Felidhu Atoll. Even trips to Gaafu Thaalu or Alifu or the equator down south are possible with guests taking a domestic flight to join the boat or leave the boat. Depending on the length of the routings there might be an extra surcharge for the fuel cost. No matter which trip route you choose all the cruises are spectacular fun and during which, if not a certified diver yet, you could learn how to dive or improve your diving skills by adding more advanced/expert courses at our diving centre on board. When fishing we guarantee you experienced staff, the best fishing spots and opportunities and when simply cruising a unique combination of activities. The MV Carpe Vita is brand new luxury 38 m long motor safari yacht with a wooden hull, designed and built by an experienced Maldivian boat builder which will be completed in January 2011. It has 3 decks plus a sundeck. 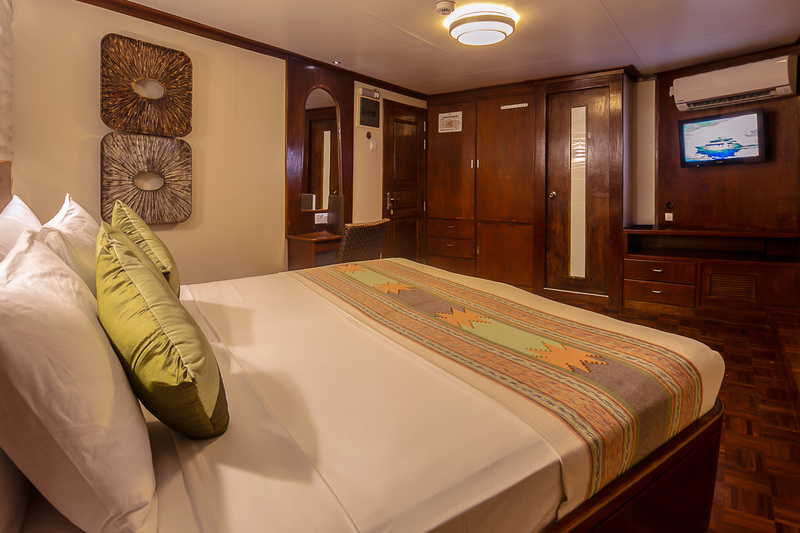 The lower deck has 6 standard cabins 2 separate staff cabins. The engine room. Crew compartment. On the main deck you will find AC acclimatised lounge/restaurant area, with a coffee / tea /buffet table offering you coffee/tea throughout the day. It also has a wide flat screen TV, DVD/MP3 player, in house sound system, library and comfortable sitting area with plug points for laptop use. From the outside as well as from the inside a staircase will lead you to the upper deck and bridge area with the bridge area with sofa seating area to accompany the captain while driving the boat Outside shaded sitting area in front of the bridge with fabulous view Our beautiful and very spacious two Suite rooms. Carpe Vita does not require a min. amount of dives as that does not always tell enough. They do require minimum of Advanced open water certification OR an Open water certification (OW) with 100 looged dives to be able to join all the dives offered during a trip. Nitrox certification with the multiple dives per day they offer is also highly recommended as well, but can be done on board as well in case you do not have it yet. If you do not have an Advanced certificate and less than 100 logged dives you can take the Advanced open water course on board also. The dive instructor on board is responsible for everyone’s safety and can ask people to sit a certain dive out if he thinks they are not experienced enough for it. On ther special South routings with lots of current, we do require a minimum of 100 dives experience and experience with currents. For the experienced team working at the fully equipped PADI Dive Centre on board your safety comes first. We use a 55 foot (18 meters) diving dhoni built by the same company as the Carpe Vita itself with the best facilities, including hot water shower/ toilet, 2 fresh water showers at the back and a fresh water tank for cameras. All the diving equipment will be installed on the dhoni, giving more space to the Carpe Vita itself plus enhanced safety. Additional benefits will be fast and safe transfers to the dive sites and extra comfort for putting on your gear. Nitrox (EANx) breathing mixtures are available and prepared with the best quality equipment available on the market (Nuvair (R) Membranes, Coltrisub and a Bauer Compressors); Included also isCarpe Vita snack bar. Dive gear rental services are available as well as SONY quality underwater video-cameras and cameras. Every guest wanting to dive on board of the Carpe Vita has to declare his/her physical ability to support diving exercise and physical stress. Once on board, the student has to fill in the PADI Medical Statement Form without any areas being marked as a YES. If there are questions answered with YES, feel free to consult your physician or Carpe Vita Staff or both for any clarification you may need. Just note that if there still is a question answered with YES you need to have the form compiled and signed by a Physician, who will declare “I find no medical conditions that I consider incompatible with diving”. Diving will not be possible without the form properly signed. A visit to a local physician (at the student expenses) cannot be guaranteed during the cruise trip. Nitrox or EANx - Main Info: Why should I dive with it? What is it? Where does it come from? Nitrox breathing mixtures have become a must in the current diving industry because they provideNitrox on Carpe Vita the diver extended bottom time, compared to the air ones. There are many others reasons why divers that have tried it do not want to dive with normal air anymore: one reason particularly is the increased muscular power experienced during and after the dive. As for the other reasons we suggest you try it out and experience it yourself.. or feel free to contact us for additional information (e-mail link to [email protected]). The Nitrox (or EANx) breathing gasses have the very same components as the normal diving air tanks, however the Oxygen (O2) content is increased. Normal air contains 21% of O2 (in volume), while Nitrox gasses have an O2 percentage that varies from 32% up to 40%. Normally the most frequently applied mixture is 32% (or EAN32). The compulsory need for a specific course, available on the Carpe Vita, result from the fact that the higher the O2 percentage in the breathing mixture the more shallow you can dive. Only diving professionals can teach you how to enjoy and make Nitrox a special scuba diving experience. When you fly in on the same day of commencement of your trip on either of our boats, you will be met upon arrival by a representative of Carpe Diem Maldives, who can be identified by a crew polo or t-shirt and sign board with the companies’ logo. The representative will then confirm the below check in timings or inform you in case of any changes. In case you can not find anyone please contact +9607950883. Should you stay in a hotel prior to your trip with us, we will meet you at the info/help desk arrivals hall at our check in timings as described below. We are not able to provide pick ups from hotels. what options do you have when you arrive early morning before check in or have late departure flight? Possibilities are to store your luggage at the airport and visit Male city. There is a ferry going every 10 minutes from the airport to Male’city which costs 1 USD p/p one way Other possibility is to visit the nearby airport hotel, Hulhule Island hotel and make use of their facilities. The hotel offers different packages like a swimming pool package of 72 USD p/p which includes transfer, luggage storage, 1 drink, use of towels, Wi-fi, 10 minutes of reflexology, sun beds, swimming pool, showers and changing rooms. No reservations are needed for this and cost can be paid directly to the hotel reception. 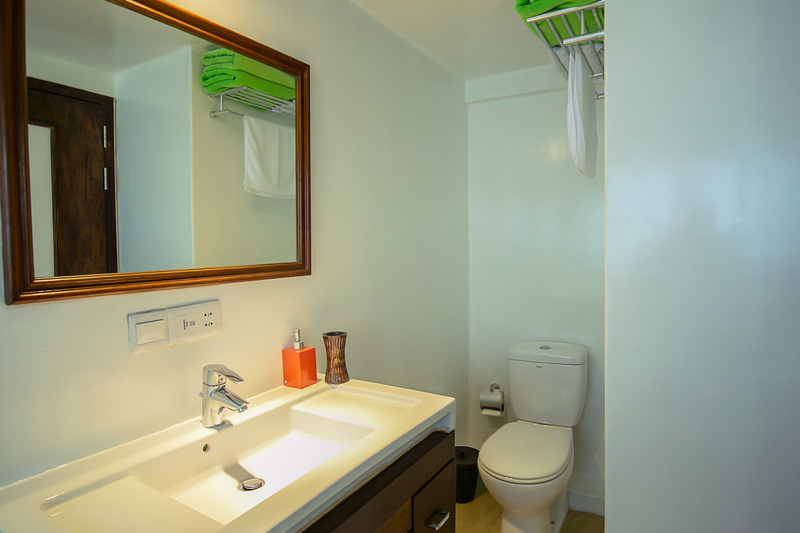 Or possible day room use in a guest house in Hulhumale depending on availability. The day before disembarkation the boat usually comes back to port between 3 and 4 pm after which guests will be offered a visit to Male’city, which will take around 1 1/2 to 2 hours. what are the check out timings for your boats? what is the earliest time of departure on the day of disembarkation? Early flight departures on the day of disembarkation are possible but will limit the amount of dives the day before due to 24 hours no diving before flying. We offer a maximum of 2 dives on the day before disembarkation. Sometimes this may vary however depending on the itinerary. If the boat still has to cross a long distance then only 1 dive will be offered. what is the minimum of dives required to join your trip? Diving conditions in the Maldives can be challenging, especially on Deep South itineraries. We therefore strongly recommend an AOW certification or OW with a minimum of 100 dives with experience in deep dives (up to 30 m), current and night dives in order to be able to participate in all the dives offered during an itinerary and to have the best chance of being comfortable with all of the diving conditions you’ll encounter. Our dive instructor on board is responsible for everyone’s safety and can ask people to sit a certain dive out if he believes they are not experienced enough for a particular dive. PADI courses are available on board and can be done during our trips. can I pay the extras by credit card on the boat? Payments for extras taken on the boat can be settled in either cash (USD or EUROs) or by credit card. We accept all major credit cards (VISA, MASTER and AMERICAN EXPRESS). We provide 11.5 and 13.5 liter aluminium tanks FOC and have 15 liter steel tanks upon request and at an extra charge. As we only have a limited number of 15 liter steel tanks it is important to reserve them in advance. All rates are subject to 12% GST surcharge. We do but are not standard available in each cabin. We have a few on board which you can ask from the room boy. do I need a reef hook? Reef hooks can be useful particularly on channel dives with strong current. Read our article here. In case you do not have one, they are available for rent or to buy (35 USD + GST) on our boats. This multifunctional hook is designed by our own Carpe Diem Maldives team and can be used as a reef hook, but also as a pointer stick and tank banger. We have wireless routers on board that work on 3G basis. The internet connection will be good enough to read emails but not fast enough for large downloads. Connection speed depends on location of the boat. Fee will be of 15 USD p/p + GST for 7 night trip and 20 USD p/p + GST for 10 night trips. can you cater for PADI courses during the trips and do you rent out equipment? On all of our boats we have a fully licensed PADI dive school on board and at least one dive instructor. Courses can be provided in English or German language. Please however inform us of any course wishes prior to your trip. what is your maximum dive time per dive? Maximum dive time will be 60 minutes or 50 bar (700 PSI) unless otherwise indicated by the dive team during the briefing. A dive insurance is mandatory. Short Term insurance can be arranged on board valid for 7 or 14 days at a cost of 20 USD + GST or 30 USD + GST respectively.